This summer, drum corps fans will be treated to a new piece of music to cap off the awards ceremony at the end of each Summer Music Games event. Replacing the traditional "America, O'Canada" by longtime Madison Scouts arranger Scott Boerma, which has been played during DCI finales since the 1990s, will be "Champions Fanfare" by Jay Kennedy. Kennedy, wrote "Champions Fanfare" specifically for Drum Corps International. The piece was christened in 2004 during the DCI Tour of Champions which brought six corps to California for a week-long tour that followed the World Championships in Denver. "When we debuted 'Champions Fanfare' on the Tour of Champions in 2004, both the performers and fans found the piece moving and inspirational," said Phantom Regiment director Pat Seidling. "Fans across the country this summer are definitely going to enjoy it much as our California fans did in 2004" Kennedy has composed music for a variety of genres including television, radio, film, jazz and concert bands, and drum corps. His works and arrangements have been heard in Radio City Music Hall, on the Tonight Show with Johnny Carson and in commercials for McDonald's, Coca Cola and Nike, among others. Kennedy currently serves as the vice president for experimental programs and institutional assessment at the Berklee College of Music in Boston. "We see this change in repertoire as a chance for Drum Corps International to present a work that is more inclusive of the true international spirit that is now part of the drum corps experience. 'Champions Fanfare' – composed and arranged by Jay Kennedy – presents a universal melody while including a flavor of Americana through the "Simple Gifts" tune to respectfully acknowledge our roots," said DCI executive director Dan Acheson. Listen for the "Champions Fanfare" following the announcement of scores at each DCI sanctioned event this summer. 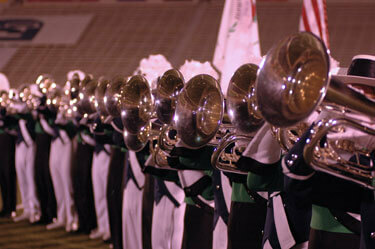 Hear the "Champions Fanfare" in this video clip as performed in 2004 at the Rose Bowl during the Tour of Champions.